THE RULEBOOK SHOULD BE USED AS A GUIDE ONLY. A Short Resume of the Club History. famous probably being "The Pit Bar," at Foxhall Stadium. have ended up at Rushmere Village Hall, Humber Doucy Lane, Ipswich. All cars must resemble Saloon Stock Cars. 1. 16D Parma Home-set motors only. 2. Plastic or brass back bracket permitted to fix motor to the drive axle. 4. The only permitted contrae is the plastic 27 tooth type. 1. Wheels must be of the 22mm size. 2. Wheels must be covered by the bodyshell and must not stick out. 3. The only type of tyre permitted is rubber and must suit the wheel. provided it is in the correct shell. 1. 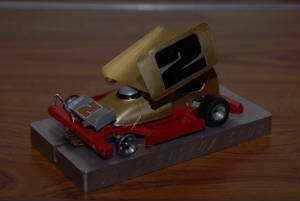 Cars are to be of the 1:24 scale type only. 3. No two-seater cars permitted (i.e. no sports cars). 1. Chassis must be made of plastic only. flat contact surface over their whole length. 2. Bumpers and straight throughs must be made of plastic. 3. Bumpers must cover the entire width of the front and rear of the car. 4. Front/rear bumpers must not be sloped, bevelled or rounded. 1. All cars must weigh over 4oz. but not more than 7oz. 2. All weight must be disguised. a fin plate, black on white. 3. Front wheel suspension is allowed but no rear wheel suspension. 4. All cars must be painted. guide or an aluminium body shell. 6. Body shells are not allowed to drag along or contact the track. at least the front axle. 2. Plastic or brass bracket permitted to fix motor to the drive axle. 4. The only permitted contrate is the plastic 27 tooth type. be approved by the club. Minimum size to be as the club template. when the 11.5 is not available. beyond the front and rear wheels. 1. All cars must weigh less than 10oz. 3. No suspension on either axle. Two wheel drive only. 4. No tape is allowed in the construction of the car. two-sided adhesive tape or small screws (common sense to prevail). 7. All cars must be painted. 1. If your car fails scrutineering you have until the next race meeting to put it right. may correct the problem and have the car re-checked by the scrutineer. 3. A car may be randomly checked by the scrutineer at any time. to repair during the duration of that heat. race will be re-run with the offending driver starting from the original grade. be driven by the other driver. 12. The whole car must cross the start/finish line to obtain its final race position. that reaches the start/finish line first; but the above rules still apply. 16. If you wish to use another car/motor it must be scrutineered before it is raced. 17. Anybody causing a head-on will be disqualified from that race and the race re-run. 19. All drivers must complete the required number of laps. 21. If only one car is left racing and the lane is clear, a race result can be declared. will then be declared at the positions they are in. races later for example, nothing will be done and the result WILL stand. 24. The start marshall and/or back-up will have the final say on any racing decision. 25. A Christmas Fun Night will be a feature of the Racing year. individuals are responsible for clearing up and disposal of their own mess. 27. Only the Parma 16D Home Set motor will be allowed. 1. Each driver will have three heats with a 6 lap race in each lane. the position will be decided by a run-off between the drivers concerned. final will be 10 laps with one race in each lane. no. disc will be the winner. In the event of all six tying the heat will be re-run. Race win 5 pts., 2nd 4 pts., 3rd 3 pts. , 4th 2 pts., 5th 1 pt. and 6th 0 pt. These points are added to the points chart. semi. i.e. : 1st 6 pts., 2nd 5 pts., 3rd 4 pts., 4th 3 pts., 5th 2 pts. and 6th 1 pt. 1st 10 pts., 2nd 8 pts., 3rd 6 pts., 4th 4 pts., 5th 2 pts. and 6th 1 pt. by this plus a rolling drade will also operate (an average of your grades). sleeping chart, you can only be down graded one grade at a time. permission) but must complete the rest of the meeting from gold. The highest average points scorer will start from silver. The next five top average points scorers will start from super star. and Points champion [silver]), will start from super star. gold (with starter's permission) but must complete the rest of the meeting from gold. The highest points scorer from silver. All major champions i.e. full club level and above, will start from silver. starter's permission) but must complete the rest of the meeting from silver. The positions will be spread roughly 25% each between red, blue, yellow and white. All major champions i.e. full club level and above, will start from red. permission) but must complete the rest of the meeting from red. Drivers can only go down one grade each points chart. Any driver returning after a long break must return in the grade they were last in. sleeping chart but if they return to be added to the present chart. final round is a double points round. resistance between 5 and 15 ohms. Hand controllers may be subject to random inspection at any time. years should be supervised by an adult. 1. All drivers must be book-in and scrutineered at race control by 7.30 p. m.
2. Pre-booking is available via the website or at the previous weeks meeting. 3. The meeting will start at 8.00 p.m. prompt. 6. All drivers are expected to race in semi-finals and finals if they qualify. A set number of meetings should be attended to be eligible to enter Championships. • Four up to the Suffolk Championship. • Six up to the Foxhall Championship. • Two up to the British Championship. • Eight up to the World Championship. attended the required number of meetings will be allowed to enter the Championship. disputes are to be settled on the night. the member does not wish to pay. Have been put together in an attempt to have and maintain harmony within the club. All Championships to be run from grades. Four heats (drawn) from normal club grade over six laps. Quarter-finals (drawn) from normal club grade over six laps. third place to final (normal run-off rules apply). Final (drawn). Eight laps with two consecutive races in each lane. (If more than 15 racers but less than 35 - TWO WEEKS). As above excepting six heats (drawn), four 1st week and two 2nd week. (If more than 35 racers - TWO WEEKS). highest third places qualifying for semi-finals (normal run-off rules apply). Final (normal). Eight laps with two consecutive races in each lane. Three heats (drawn) from normal club grade over six laps. Semi-finals (drawn) from normal club grade over eight laps. "B" Final (drawn) from club grade over eight laps. Three heats from normal club grade over six laps. Semi-finals from normal club grade over six laps. Final from normal club grade over ten laps. straight through to the final. finals using six lane track - five lane track would be top twenty. thirds - run-offs as below. each or top two and highest scoring third if five lane. A final over 10 laps and B final over eight laps with two races in each lane from yellow. (three tying); 2, 3, 4 and 5 (four tying); each driver having one race in each lane. tying a heat would be re-run. the lane that they would have occupied in the next race shall remain empty (i.e. the heat will take place with five drivers), no one shall be moved up a place. checked after the final and will not leave the track until the scrutineer agrees. that lane only (two races in the lane scenario would be back in for second). granting of this will be at the discretion of host club chairman. 5 for 1st; 4 for 2nd; 3 for 3rd; 2 for 4th; 1 for 5th and 0 for 6th. Track - Five lane with straight through chicane centre section. third place to final. (Normal run-off rules apply). yellow. Eight laps with two consecutive races in each lane. the Chairman agrees to people staying on after the meeting to practice then those that practice will be responsible for putting the track away. A good social standard of behaviour is insisted upon. Ganging-up on other members during a race or encouraging such behaviour. De-meaning comments towards other members. offence. Punishment may be a ban for a race, a heat, a meeting or indefinitely or a points deduction. There is a right to appeal. If this does not deter members a more formal disciplinary system may be introduced. Drivers are asked to use common sense and be honest at all times. the club during the first six weeks of the season will not be allowed to race after then unless membership has been paid. subsequently wishes to become a member will be at the discretion of the secretary. Commitment to F.F. Slotstox Club Rule. 2. To promote and serve the club at all times. Secretary of un-availability as soon as practicable. not feel that it is not their job, it is. committee member of any other slotstox club during this time.